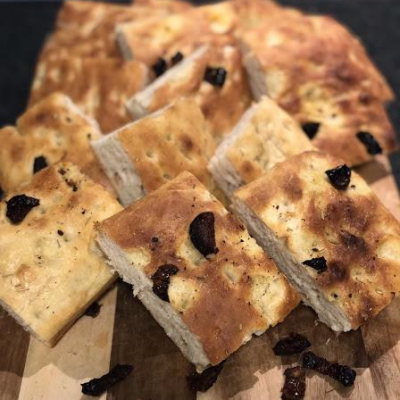 Focaccia is a traditional Italian flatbread baked with wheat flour. It is considered the ancestor of pizza. In earlier times, the bread would be baked by the poor, but only salt and olive oil were used to fill it. Today’s version is full of flavors and tastes: dried herbs, olives, dried tomatoes, onions, cheese and even fruits. Today we present our tried and tested recipe. The Italian bread does not have a certain shape, you can make it round or square. The thickness of the dough will also depend solely on your preferences. Okay, let's get started. Ingredients: 5 ½ cups of wheat sieved flour, approximately 2 cups of water (little less), 1 tablespoon of dry yeast, 2 teaspoons of salt, 2 teaspoons of sugar and 3 tablespoons of olive oil. Mix flour, yeast, salt and sugar in a bowl. Spicy herbs such as basil or oregano can be added if desired. Add warm water and vegetable oil to the dry mixture. Mix the dough. You can also add dried tomatoes or olives to the dough. Remove the dough for 2-3 hours in a warm place. After some rise time, place the dough on a tray or other baking tray, lubricated with vegetable oil. Spread the dough into its shape, make some dimples with your finger, then leave the dough resting for another 1 hour. Heat the oven to 420°F. Before placing the focaccia in the oven, spread some olive oil over it, spray it with water and sprinkle it with dried rosemary. Bake it for 15 to 20 minutes or until golden brown. Remove the cooked focaccia from the oven and spread some olive oil over so that it does not become stale. Cut and serve.